"I'll teach you how to jump on the wind's back, and then away we go!" Three lucky children are about to discover a magical world beyond the clouds called Neverland. In Neverland, there is no school and no rules and children can play all day. In Neverland they meet Peter Pan and have lots of exciting adventures. It's a dream come true! But no dream last forever. After all, every child has to grow up sometime. Unless, of course, that child is named Peter Pan. This beloved fantasy classic has been brought to life with lavish new illustrations from Charles Vess, a World Fantasy Award winner for Best Artist. 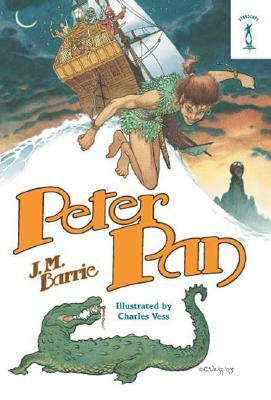 Sir James Matthew Barrie was a sometimes journalist and playwright who won instant immortality with the production of his play Peter Pan in 1904. The play was turned into the book Peter and Wendy in 1911. Barrie died in 1937. Charles Vess is one of the most acclaimed artists in the field of illustration. He is the winner of the World Fantasy Award for Best Artist. A critically acclaimed fine artist, he has had numerous gallery showings in this country and abroad. He lives in southwest Virginia.